Advocates for people with Lyme Disease want public health agencies to take a more aggressive stance in treating the tick-carried disease early, before it leads to later health complications. 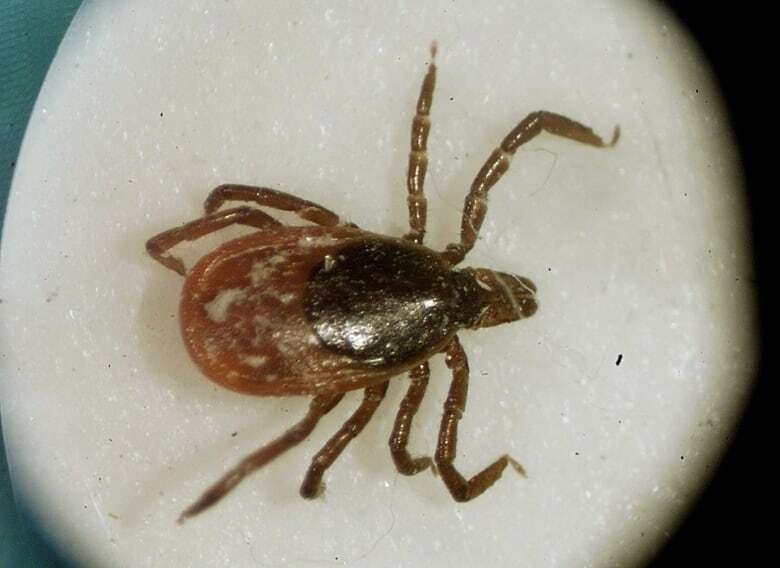 With summer weather arriving, Ottawa Public Health is again warning the public to watch out for signs of Lyme disease, an infection caused by Borrelia burgdorferi, a bacteria transmitted through the bite of an infected black-legged tick, or deer tick. The public health agency is advocating people who believe they have been bitten to get a shot of antibiotics as a preventative step. Dr. Carolyn Pim, Ottawa's Associate Medical Officer of Health, said people who spot the tick on them should remove it carefully, thoroughly wash the area around the bite, and then get an antibiotic pill. People should then submit the tick to Ottawa Public Health for testing. Some deer ticks can carry the bacteria Borrelia burgdorferi, which can lead to an infection. (Victoria Arocho/The Associated Press)But Jim Wilson, the president of Canadian Lyme Disease Foundation, said one dose of antibiotics is not enough. "That's not sufficient and we deal with the fall-out from that," said Wilson. "We've been dealing with people from the Kingston area who were given two dosages of antibiotics. They're getting symptoms a week, two weeks later, they go back to try to get more treatment and doctors won't even acknowledge the symptoms are Lyme disease," he said. Lyme disease can be difficult to diagnose because symptoms can take from three days to one month to appear and many of the symptoms — fever and chills, fatigue, headache, muscle and joint pain — are similar to other ailments. If untreated, it can lead to more serious conditions such as chronic arthritis. There were 47 confirmed cases of Lyme disease reported in 2013, a jump compared to the previous high of 19 cases in 2012. Ottawa is not considered an endemic region for Lyme disease. But of the 47 cases, two reported Ottawa as their area of exposure. The ticks are endemic to several places off Lake Erie, including Point Pelee National Park. A number of eastern Ontario regions are also becoming high-risk locations, including Belleville, Kingston, Gananoque, Cornwall, Westport, and Sandbanks and Presquile Provincial Park. Green Party leader Elizabeth May has introduced a private member's bill to develop a national strategy for dealing with Lyme disease. The House of Common's Health Committee is set to discuss the bill on Thursday. Watch for ticks from early spring to late fall every year. Avoid tick habitats such as tall grass, bushes and woods. Stay in the middle of trails, if possible. Do a “tick check” at the end of every day spent outdoors. Carefully inspect yourself for any ticks, starting at your ankles and moving up. Take special care around your knees, armpits and head. Blacklegged ticks are very small, particularly during the nymph stage, so look carefully. Check children and pets as well. Use an insect repellent that has "DEET". Always read and follow label directions.